ARS scientists have shown that some tree nuts such as pistachios actually have fewer calories than previously thought by improving the method used for estimating calories. We all love nuts, but we’re careful not to eat too many because of the high fat calories. Now, there may be less to worry about. In a series of studies, USDA’s Agricultural Research Service (ARS) physiologists David Baer and Janet Novotny looked at how many calories of almonds, walnuts, and pistachios are used by the human body. There are a lot of factors to consider, such as whether the nuts are raw, roasted, or ground, and how well they’re chewed. Over the years, nutrition science has become more sophisticated, and research by ARS scientists is showing that counting calories isn’t always as simple as it may seem. The concept behind this is “bioavailability.” For example, while an ounce of almonds has approximately 160 calories, not all of those calories may be used by the human body. This is the idea of “bioavailability.” When food is eaten, it is broken down into its nutritional components, and its calories are burned for energy. However, just because nutrients are present doesn’t mean the body will readily use them. The question of whether those nutrients are “bioavailable” is being examined by scientists in the ARS Food Components and Health Laboratory in Beltsville, Maryland. This lab is part of the Beltsville Human Nutrition Research Center. In their 2011 study, Baer and Novotny found the calorie uptake from pistachios was 22.6 calories per gram—5 percent less than the currently accepted 23.7 calories per gram. 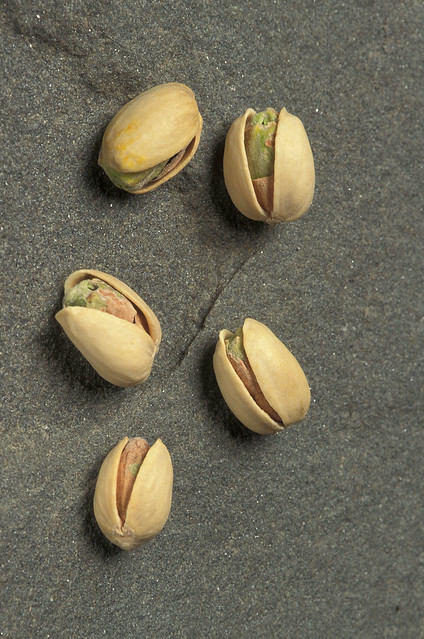 An ounce of pistachios has 161.9 calories, but only 153.8 calories are bioavailable. That may not sound like a lot, but a calorie reduction of 5 percent can be quite significant on a daily basis. There’s also a bonus. In their study, they found that pistachios lowered LDL cholesterol by 6 percent, but didn’t significantly change total plasma cholesterol. Providing accurate information about metabolizable energy (ME) content—or calories—of foods is important for reliable food labeling and has health ramifications, according to Novotny. In another study, the team found that a 1-ounce serving of walnuts contained 146 calories, which is 39 calories—or 21 percent—less than the amount in the label, according to Baer. This finding could explain why some of us don’t gain excessive weight from eating nuts. Baer and his colleagues also looked at almonds, and here, too, found the trend continuing. Almonds were found to have 32 percent fewer calories of ME than determined by the Atwater factors: 129 calories instead of 168-170 calories. The way nuts are processed also impacts their ME value. In whole raw nuts, the fewest fat calories were taken in. Chopped nuts provided the next fewest compared to the label, and nut butters were consistent with the fat calories on the label. So, don’t be afraid to eat those nuts! Thanks for sharing the results of these researches. I love nuts! It's good to know that calories un them are exaggerated and we can eat them more without any fear.